We are standing on Emmitsburg Road facing west/northwest with Seminary Ridge in the distance. Directly in front of us is Joseph Sherfy’s home, canning house, corn crib (small structure at the extreme left) and, beyond the first line of Confederates, a portion of his orchard. The Confederates closest to us are the 18th Mississippi, of Barksdale’s Brigade; beyond them are the Georgians of Wofford’s Brigade. Both brigades are of McLaws’ Division, Longstreet’s Corps, Army of Northern Virginia. 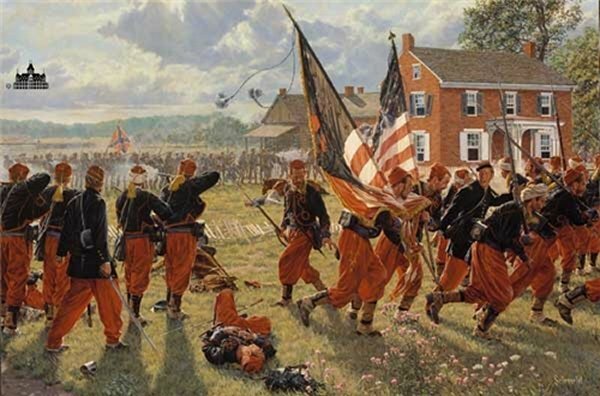 The colorful zouave troops closest to us belong to the 114th Pennsylvania, Graham’s Brigade (1st Brigade, First Division, III Corps, Army of the Potomac. The captain at the right has ordered the color guard to fall back a distance up the Emmitsburg Road, the regiment’s only route of escape, since at this point the Confederates are not only in their front, but on their left flank and rapidly gaining their rear. The rest of the regiment will fall back to their colors, and the maneuver will be repeated several times until the regiment has arrived safely at Cemetery Ridge and the main Union line. The dead horses and solitary Yankee corpse in the middle distance, between the two opposing lines of troops, are from Bucklyn’s Battery (also known as Randolph’s Battery), Battery E, 1st Rhode Island Light Artillery, whose right gun was posted in the area a short time before. The Sherfy home and outbuildings were occupied by Federal soldiers who sniped at the oncoming Confederates from the windows of the home’s south side. We can see the damage done by Confederate returned fire. The smoke we observe in the distance, from behind the trees just beyond and to the left of the wood-sided canning house is from the guns of Patterson’s Confederate Battery.